Contrast the domestic and foreign policies of Presidents Carter and Reagan. Analyze liberalism and the rise of conservatism in the 1970s and 1980s. Analyze the United States and Soviet Union during the Cold War in terms of their power and influence. Analyze the First Gulf War. Contrast the presidencies of George H.W. Bush and Bill Clinton. 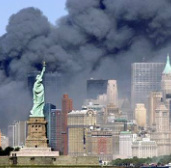 Trace the War on Terrorism from September 11th through the end date of the War in Afghanistan. Contrast the presidencies of George W. Bush and Barack Obama.